We develop a new metric for job scheduling that includes the effects of memory contention amongst simultaneously-executing jobs that share a given level of memory. Rather than assuming each job or process has a fixed, static memory requirement, we consider a generalscenario wherein a process’ performance monotonically increases as a function of allocated memory, as defined by a miss-rate versus memory size curve. Given a schedule of jobs in a shared-memory multiprocessor (SMP), and an isolated miss-rate versus memory size curve for each job, we use an analyticalmemory modelto estimate the overallmemory miss-rate for the schedule. This, in turn, can be used to estimate overall performance. 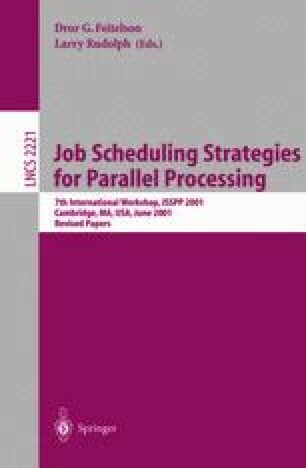 We develop a heuristic algorithm to find a good schedule of jobs on a SMP that minimizes memory contention, thereby improving memory and overall performance.